The red-eared slider turtle (commonly known as Florida turtle) is called this because of the two red stains it has on its head behind the eyes. These stains disappear in time. The upper part of the shell has dark stains and the belly and the limbs have reticulate drawings. The fingers on the end of the rear limbs have interdigital membranes. Its average size is 12 to 20 cm and 40 cm at most. 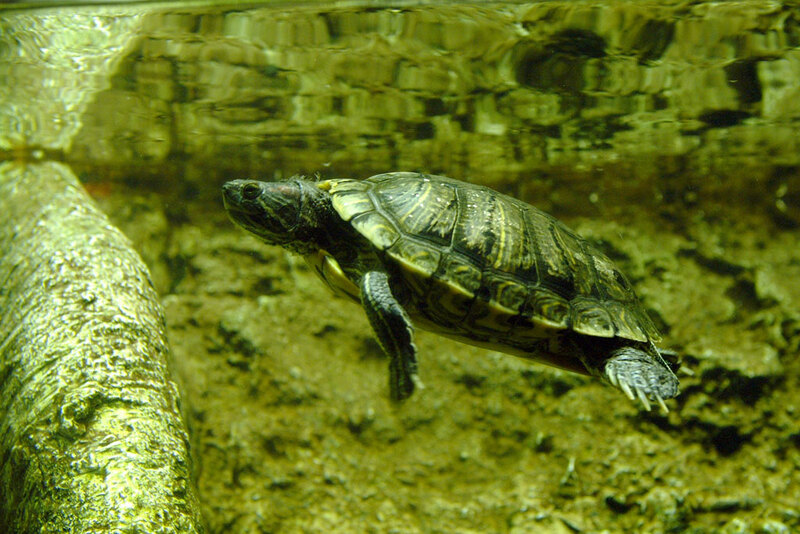 The red-eared slider turtle is an animal active in the half-light, which rest during the winter period. It feeds on small prey such as fish, tadpoles and crustaceans, and some vegetables. It is a highly prolific oviparous animal that spawns several times a year with 12 or 15 eggs, which the female buries in a gallery in the sand. The males perform a complex mating ceremony that ends with copulation in the water. This turtle generally lives in marshy areas with a tropical, temperate climate, but adapts well to other habitats. It is a turtle originally from the south of the United States, but thanks to its use as a domestic animal, it has spread to other parts of the world. It is spreading fast in the Mediterranean. There are currently several European countries that have prohibited its sale and commercialisation, as it has been classified as harmful to the fauna of these countries.